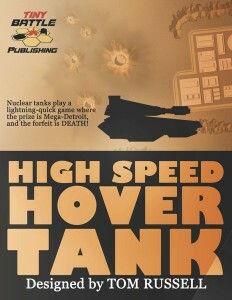 Tiny Battle Games announced the release of High Speed Hover Tank, a post-nuke themed game of tank combat. The game is described as a “fast-paced, card-driven-ish, dice-slinger’s paradise” with professionally printed 1″ counters, 10 scenarios to play through, and an 11″x17″ game map. Action cards can drastically change the action, so no scenario will play the same way twice. * (70) A FULL sheet of ONE-INCH counters – big ‘n’ beautiful! You’ll need to include your own dice. 1d6, 1d8, and 1d10.